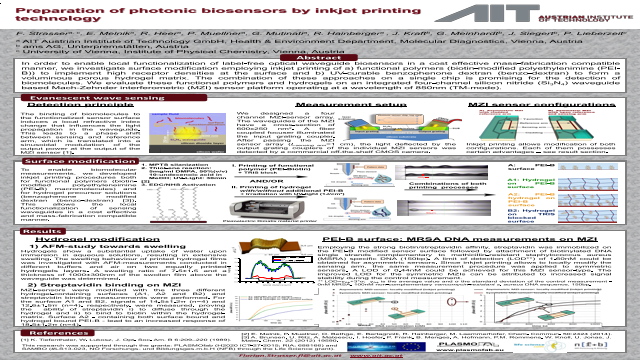 Abstract: In order to enable local functionalization of label-free optical waveguide biosensors in a cost effective mass-fabrication compatible manner, we investigate surface modification employing inkjet printing of a) functional polymers (biotin-modified polyethylenimine (PEIB)) to implement high receptor densities at the surface and b) UV-curable benzophenone dextran (benzo-dextran) to form a voluminous porous hydrogel matrix. The combination of these approaches on a single chip is promising for the detection of biomolecules. We evaluate these functional polymers and hydrogels on an integrated four-channel silicon nitride (Si3N4) waveguide based Mach-Zehnder interferometric (MZI) sensor platform operating at a wavelength of 850nm (TM-mode).Summary: In order to enable local functionalization of label-free optical waveguide biosensors in a cost effective mass-fabrication compatible manner, we investigate surface modification employing inkjet printing of functional polymers and UV-curable benzophenone dextran.References:  K. Tiefenthaler, W. Lukosz, J. Opt. Soc. Am. B 6:209–220 (1989). References  E. Melnik, P. Muellner, O. Bethge, E. Bertagnolli, R. Hainberger, M. Laemmerhofer, Chem. Commun. 50:2424 (2014). A. Brunsen, U. Ritz, A. Mateescu, I. Hoefer, P. Frank, B. Menges, A. Hofmann, P.M. Rommens, W. Knoll, U. Jonas, J.